Residents of Tamworth will have a choice of airlines for flights to Sydney from May when Virgin Australia begins flights to the Northern NSW city. Australia’s second largest carrier plans to operate between Sydney and Tamworth, the home of the nation’s largest country music festival, six times a week from May 25 using 68-seat ATR72-600 aircraft. Virgin’s flights will run every day except Saturday. Virgin chief executive John Borghetti said he was “delighted to bring competition and choice” to Tamworth and the New England region for the first time since 2001. 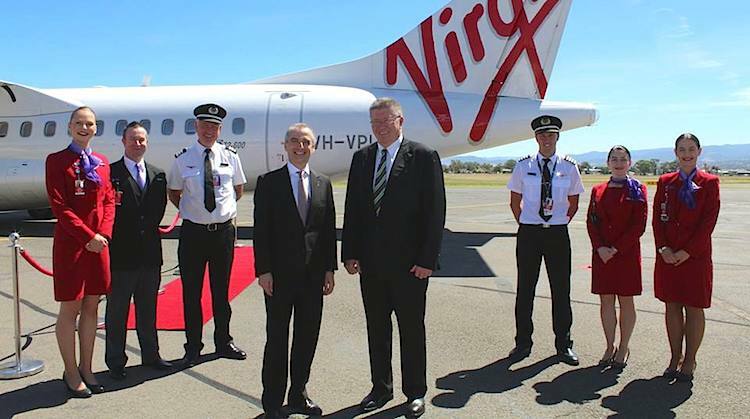 “Tamworth is both a thriving commercial hub and a tourist destination, and the introduction of six Virgin Australia services between Tamworth and Sydney per week will support the ongoing development of Tamworth as an important regional destination,” Borghetti said in a statement on Thursday. Borghetti, as well as representatives from the NSW government and local council, launched the new route in Tamworth on Thursday. Currently, QantasLink operates up to six flights a day to Tamworth from its Sydney hub, while regional carrier Jetgo this week began a thrice weekly service between Tamworth and Brisbane. Tamworth is the third NSW destination alongside Albury and Port Macquarie in Virgin’s turboprop network. Well done Virgin. You may have to step it up from one flight a day to compete with Qantaslinks up to 6 flights a day though. I believe the Qantaslink fleet is serviced in Tamworth so maybe that’s how they can get the numbers in and out so high? Locals in this region travelling on short notice have been subject to Qantas exorbitant fares far too long. I’m hopeful the competition will make a huge difference. Thankyou Virgin for recognising the importance of having you service our region. I remember Tamworth in the mid 90s when it was served by four regional airlines. About time.If it can take most of the cars off the road and some people off using the Greyhound Bus all the better.